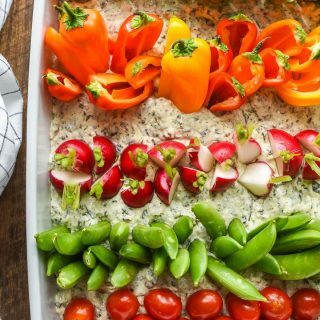 This Garden Veggie Dip is a cute and easy appetizer for any occasion! Truth be told, I’m not a natural party planner. I swoon over those darling Pinterest photos of homemade pennant banners and handwritten labels. I used to kill myself trying to replicate the effortless style of these photos, but I’ve finally realized it’s just not my gift. Over the years, I’ve slowly honed my hostessing skills and learned what’s worth it and what’s not. I used to stress myself out trying to make every single decoration and the entire menu from scratch. The food would be delicious, but I’d show up to the party exhausted and crabby and annoyed that the house hadn’t magically cleaned itself while I slaved away in the kitchen. Now, I make what’s important to me and buy the rest. This year, I bought almost all the decorations. 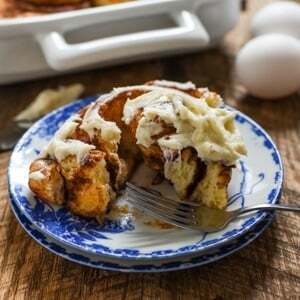 They were simple (and certainly not Pinterest photo ready), but they were CHEAP and EASY. Three cheers for that, yes!? We bought a couple of these cow pennants from Amazon as well as cow plates and cups, then I supplemented with a few twirly tractors and some recycled pennants from P’s first birthday. Now for the food. This is where I’ve really had to learn what is worth making myself and what to buy from the store. This year, I made sweet and spicy BBQ pulled pork sliders (with store bought Hawaiian rolls), macaroni and cheese (wagon wheel pasta would be perfect for this theme if you can find it! 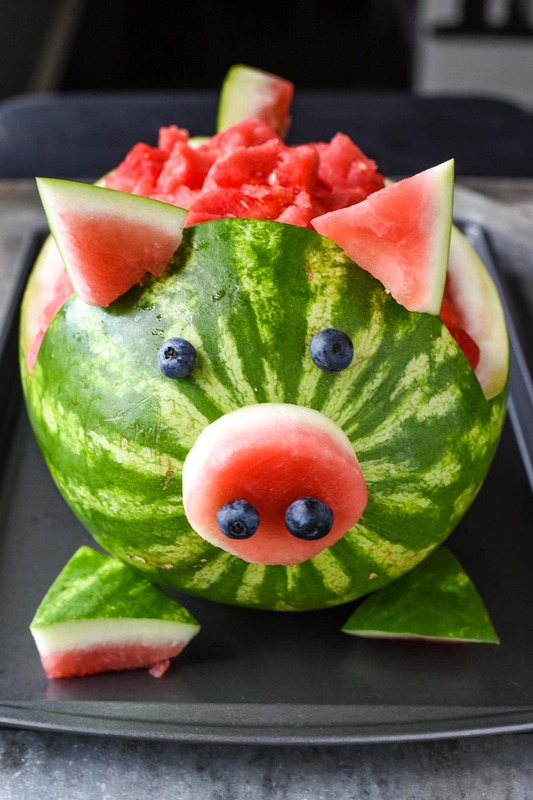 ), and a watermelon pig (using this tutorial). The watermelon pig ended up being way easier than I thought it would be and was so adorable! Finally, I got our veggies on the table with a cute garden-inspired veggie platter using my favorite store bought La Terra Fina dip. 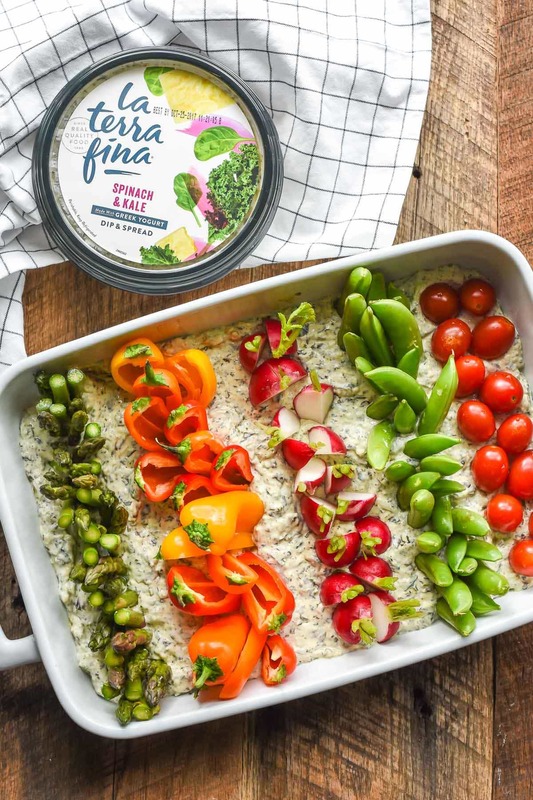 I’ve used La Terra Fina dips for several party hacks over the years, and it’s always absolutely delicious. Their dips are made with fresh ingredients and have a super creamy texture. On multiple occasions I’ve had people ask me for my dip recipe! HA! 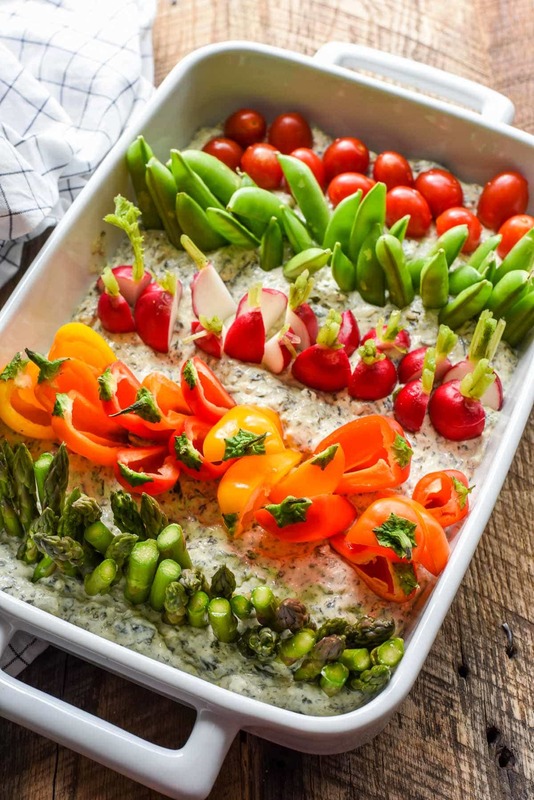 As it turns out, when you put dip in a 9 x 13 inch pan and top it with fresh cut veggies, everyone thinks you’re a party planning goddess. Really, you’re just a girl who knows how to keep her sanity. I really enjoy all their flavors. I used their new Spinach and Kale for this version, but the Artichoke and Jalapeno and Wild Smoked Salmon are my other favorites. The beauty of this menu was that most things could be prepped ahead of time or required very little prep. The watermelon pig was easily assembled the night before. The pork was thrown into the crock pot in the morning, and the dip was assembled hours before the party as well. Shout out to my lovely momma who made two whopping bucketfuls of Dirt Pudding (complete with gummy worms!) for me the day before the party. 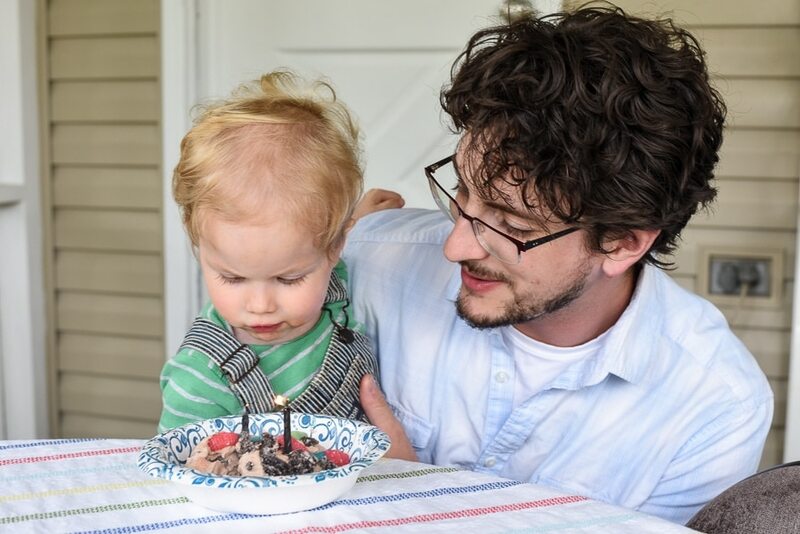 We skipped the traditional cake and stuck a candle in a big scoop of Dirt Pudding instead. I’d say our little guy was in farm themed heaven! For more easy entertaining recipes, check out my Skillet Bread and Spinach Artichoke Dip (another La Terra Fina favorite! ), Three Ingredient Slow Cooker Queso, and Chocolate Peanut Butter Puppy Chow! Spread the dip out over a 9 x 13 inch container. Prep your veggies. I like to use halved or quartered radishes, mini bell peppers (halved and seeded), snap peas, cherry tomatoes, and asparagus (cut into thirds). I've also used broccoli crowns, baby carrots, and celery stalks. Stick the veggies into the dip so they're standing up in rows, about an inch apart. This post is sponsored by La Terra Fina. As always, all thoughts and opinions are my own. 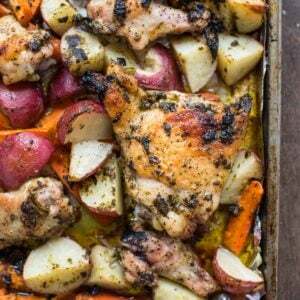 Thanks for supporting NeighborFood! I’m a new reader of your blog – very nice. We DO live in what could be considered farm country after moving 7 years ago from a wonderful suburban area. 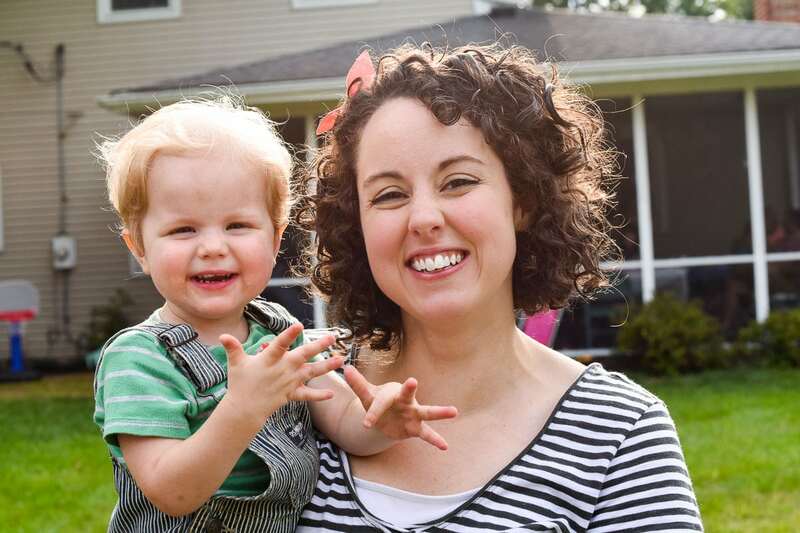 We love it here and wish we could’ve made the move years ago. 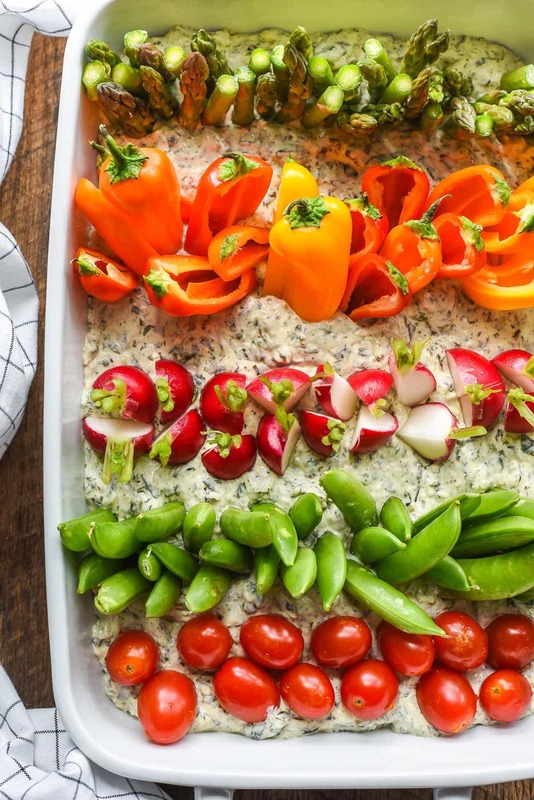 Your “field of veggies with dip” is just too cute and perfect for a 2 year olds party. I agree that less stress is the best thing ever! Pinned so parents could see the beautiful idea ! Thank you !